Golf is the game with the little white ball, right? 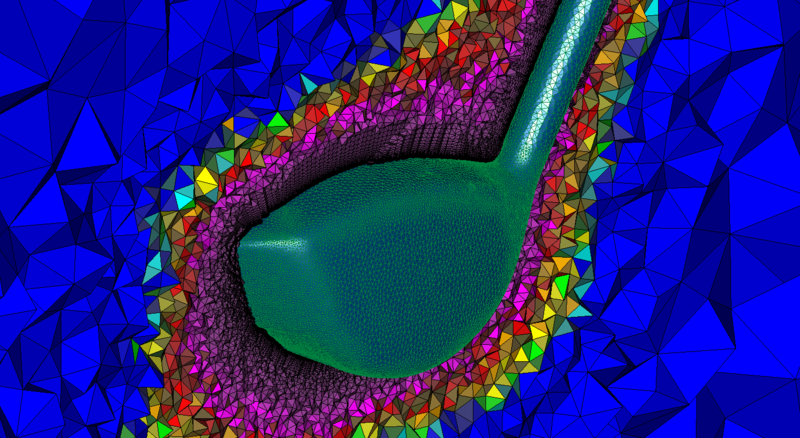 Even though it’s been over 20 years since I kicked my 2 rounds per week habit, next week’s webinar on High-fidelity, High-productivity CFD Simulations of Airflow over a Golf Club Head promises to be very interesting. Cut through a hybrid volume mesh around a golf club driver. In cooperation with our friends at Intelligent Light, we’ll be hosting a free hour-long webinar with two researchers from the University of Tennessee at Chattanooga, Steve Karman and Bruce Hilbert, as they describe their CFD process from pre to post including application of their own CFD solver. They’ll describe how they’re using Pointwise as a meshing platform with which they can couple their own research and how FieldView helps them manage the large amount of simulation results. So whether you’re a golfer, a sports enthusiast, or just interested in cool applications of CFD, this webinar is for you. We hope to see you online on the 7th. P.S. I have golfed with Steve Karman and let’s just say that both he and I can benefit from whatever insights CFD can provide about our play. Maybe the aerodynamics of thrown clubs would be more appropriate. This entry was posted in Events and tagged FIeldView, Intelligent Light, Pointwise. Bookmark the permalink.